In the summer of 1205, St. Francis, who had retired for a prayer in the small country oratory, heard the Crucifix (now at St. Clare's) talk to him ordering him to restore the church in decay. 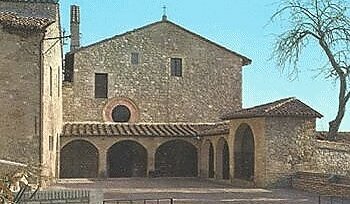 In 1212 St. Clare and her companions established themselves in this place where between 1224-25 St. Francis wrote his Cantico delle Creature (Song of the Creatures). The Clarisse lived here until they moved to the actual convent in 1260. The church is preceded by a portico; on its right opens the Chapel of St. Hieronymus (Cappella di S. Girolamo) with frescoes by Tiberio d'Assisi (1517 and 1522). The single-naved interior has a slightly ogival vault and an apse with fresco decorations of the early 14th century. The Crucifix at the main altar is a copy of the one now at St. Clare's. The wooden stalls date back to 1504. 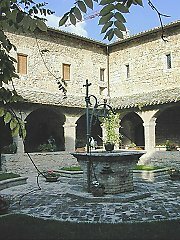 On the right, a passage leads through a room with a „Crucifiction" by Pier Antonio Mezzastris (1482) to the garden of St. Clare and to the conventual rooms. In the cloister, frescoes by Eusebio da S. Giorgio (1507), „Stigmatisation of St. Francis" and „Annunciation"; in the refectory, badly preserved frescoes by Dono Doni representing the episode of the Talking Crucifix and St. Clare leaving the signs of the cross on the bread she is blessing.